Greetings and salutations, everyone; yes, once again it is I, Mani the fairly tiny purebred border collie, filling in for the guy I live with, and here to bring you the latest news from our very wet garden. You may remember me from such posts as “Cabin Fever”, among at least a few others. Here I am in a rather uncharacteristically damp pose. See, what happened was, the guy I live with needed to water something that was transplanted out into the raised bed in the “way back”, and so he dragged the hose back there and watered, and then as he went back to turn off the hose, I discovered I could play with the hose. It was a lot of fun. That was a couple of days ago. Then it started to rain. It rained and rained, and then it rained some more. I went out in it, as you can see. The guy I live with said I looked like a completely different breed of dog. I wasn’t, of course. It turns out that I really enjoy getting all soaking. The best thing to do after that is lie in some dirt, which there’s a lot of around here, and then track stuff onto the carpet, because I can be almost certain that it was shampooed the day before. The guy I live with does that constantly, like it’s his mission in life or something, and so when I track stuff onto the carpet, he doesn’t get as angry as you would think, because he’ll be shampooing the carpet again before you know it. The shampooing thing makes a lot of annoying noise. The rain finally did stop, and so here are some pictures of what some of the garden looks like after it’s rained. Here’s how it would look if you went through the garden gate, and if I didn’t chomp you in my duty as dreaded and fierce guard dog (in which case you would run in terror). The lilacs ‘Asessippi’ and ‘Pocahontas’ are flowering on the right side of the path. The white dot past the arbor is my stuffed hippo, Nippo. Nippo was here when I got here. Well, Nippo was in the toy basket, not out in the yard. That’s what I mean. Part of the “way back”, with the leany fence showing partial repairs. 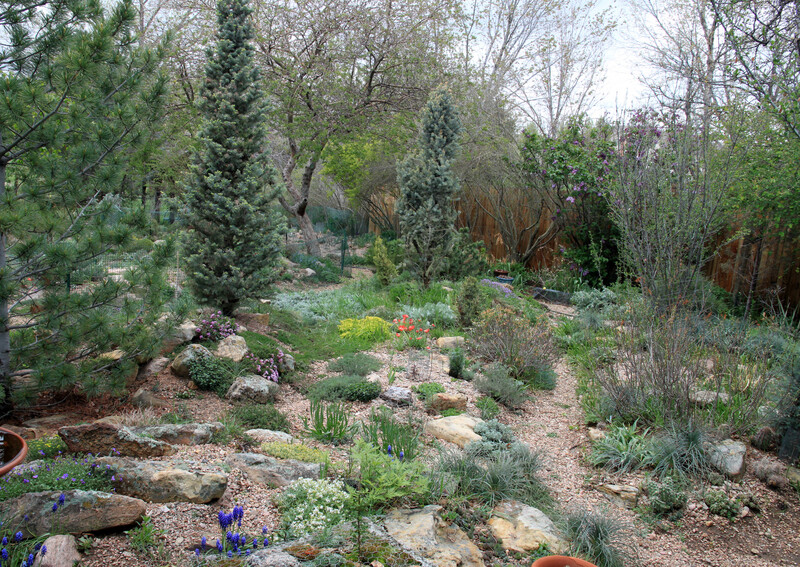 There are two Wasatch maples, Acer grandidentatum and a “dwarf” apple tree. The top of the bird bath (the green thing) broke into several pieces over the winter, so the guy I live with says the column, or pedestal, or plinth, will just sit there, “looking all Grecian and stuff”. He says, with a sigh, that the lawn needs some work. Some tulips. The guy I live with says these are ‘Prinses Irene’, which is a sport of ‘Couleur Cardinal’, and those are his two favorite tulips. Well, that’s it for today’s post. It rained, and I got soaking wet. Not much else has happened besides that. Back to my cozy chair, I guess, after being dried off with a towel. This entry was posted in Uncategorized and tagged border collies. Bookmark the permalink. In your wet state you look a little like a terrier. I have a tulip “Dordogne” which I bought because I thought it would look kind of like rainbow sherbet. Unfortunately as our springs get hotter and hotter the colors look like they were mixed with mud. You look kind of cute mixed with mud, and I say that knowing you’ll never get into my house. You wouldn’t believe how fast I am…..one minute I would be outside, and the next, inside. Couleur Cardinal and Prinses Irene are really nice, as is the parrot tulip Orange Favorite. Maureen is good too. Dillenburg and Queen of the Night is an overused combination, but still great. I think I was just tired. mani, the garden looks wonderful!! we don’t have that much in bloom yet here, but i’m waiting!! my tulips are just tight little buds so far. if i showed up at your gate, i know you would do your job, but i would be still glad to see you! Thanks; I am actually extremely friendly, though I like to think I’m the terror of the neighborhood. As if I could not love you more, you show up like Gene Kelly, but way cuter, singing in the rain, guarding the xerodome with your baby zebra. It’s unbearably adorable. 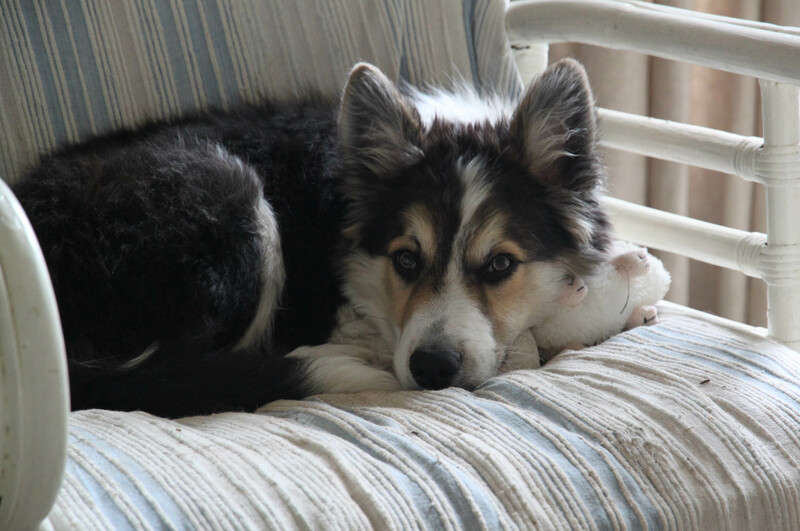 And that last picture, you with your Lamb Chop pillow: I am done for. If you were my resident somewhat smallish pure bred order collie, Mani, you would be King of the Xeroscape and I would be your humble servant. Thanks; I think the guy I live with is my servant, though he does tell me what to do an awful lot of the time. He sewed my elephant back together, so now I have my elephant again. He does stuff like that. I had a thorn in my paw and he pulled it out. So it’s not all bad. The guy you live with doesn’t have to be concerned about you, Mani… you have truly become “king of the castle.” (Or as one of your fans has so correctly stated, “King of the Xeroscape.”) What you’ve done with the garden is simply amazing! Growing season has barely begun and it already looks quite beautiful. All your digging and dancing in the rain seems to have had some effect, as has the direction you have given to “the guy” who does all the grunt work. I particularly love the look you are giving in the first photo… that’s one of the the finest “border collie “eyes” I have ever seen! 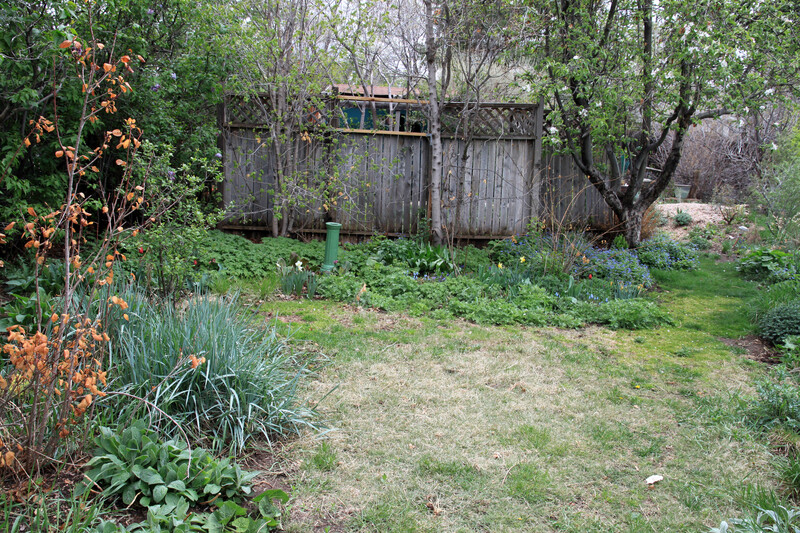 Keep up the good work of keeping the guy in line and you should have one spectacular garden by June. Thanks; the guy I live with thought that was a pretty good picture of me being completely soaking wet. Mani, could you ask the guy you live with what that tree/shrub is with the orange leaves (?emerging leaves?) that makes such a fantabulous echo with the ‘Prinses Irene’ tulips? When you get a chance, once you and Lamb Chop have fully recovered from your exertions. Oh, in the way back? Those are the dead leaves from last year, on Cotinus coggygria Royal Purple. Purple smokebush. The guy I live with says that “the help” didn’t get around to picking off the dead leaves. 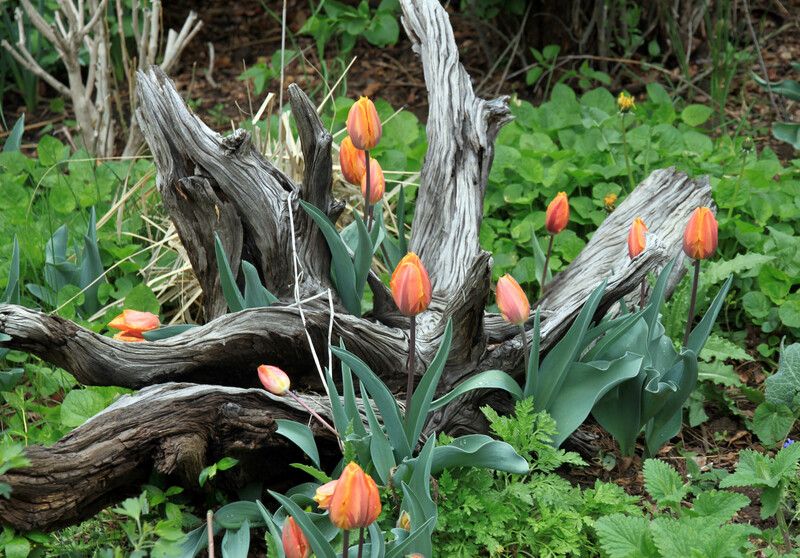 Wow, love the tulip and stump combination photograph. Gorgeous. Oh….you too Mani. Thanks; the combination was an accident though. My gorgeousness, different story. Being soaking looks excellent on you, Mani, and so does the checking-out-TGYLW’s-reaction look. He has to be helpless in the face of your adorable cuteness. Besides, you certainly supply an excuse for the near-constant rug shampooing. Really, the shampooing seems to rise to a mania. 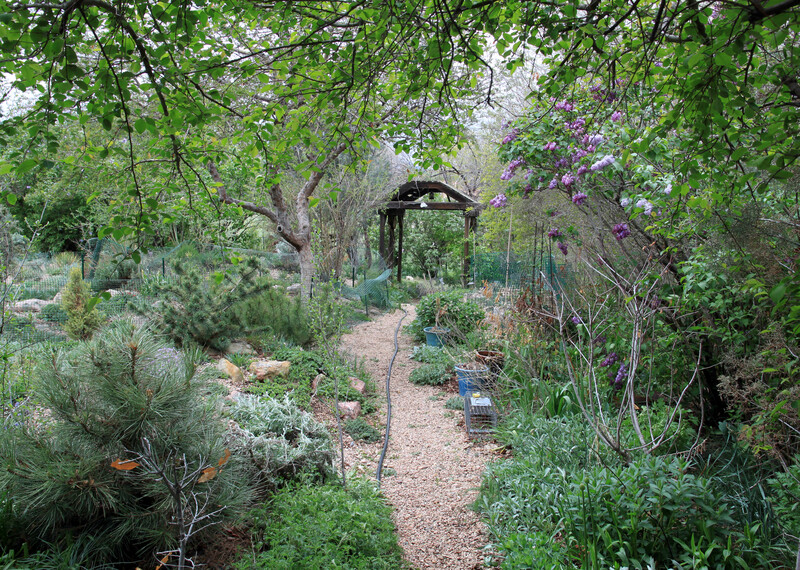 The garden presents beautifully under a low sky, and the light looks portentous, like something will happen: a snake will emerge from sheltering greenery or a running hose will writhe in invitation or perhaps a stuffed hippo will come to life. I’d get all tired with the possibilities too and need to sleep in a cozy chair. Ahem. My Floral Association soon puts on a giant Flower Show during what’s called The Garden Party of the Century. The arrangement of peachy ‘Prinses Irene’ tulip with blue-green leaves thrusting around twists of grained wood all set amidst new plant leaves, well, it’s breathtaking and would surely win Best of Show. 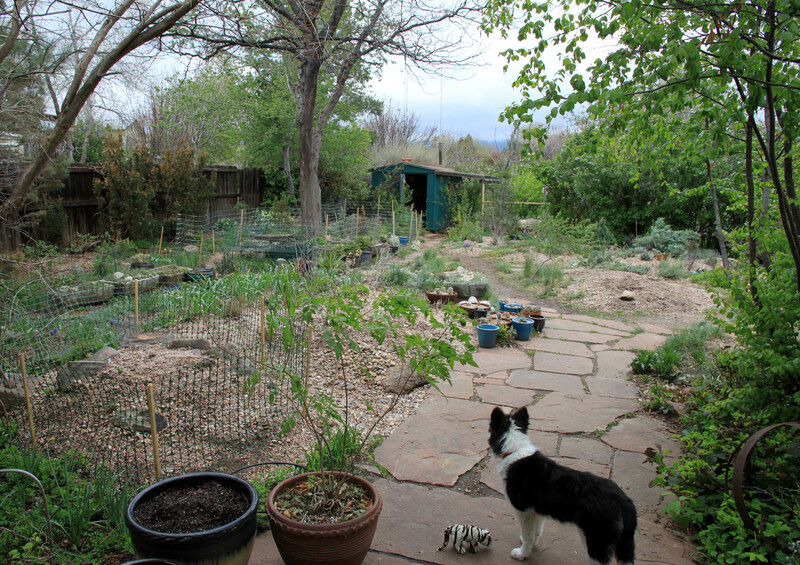 You live among garden splendor, dear dog. Thanks; well, the tulip thing is probably the only “gardenesque” feature here. It really is fun to get all soaking. 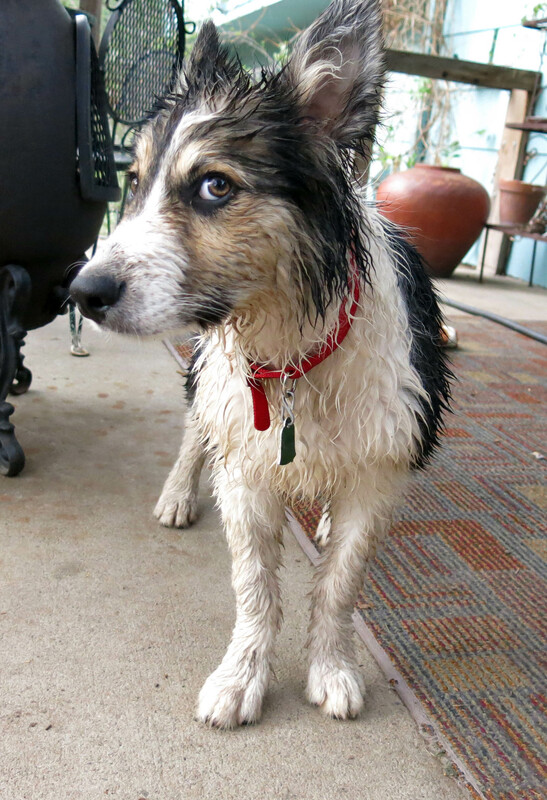 I hear that the purebred border collie who lived here before me was not a huge fan of getting all soaking, though some others were. We’re not really water dogs, but hoses, especially ones that are left on for a minute or two, definitely need herding. 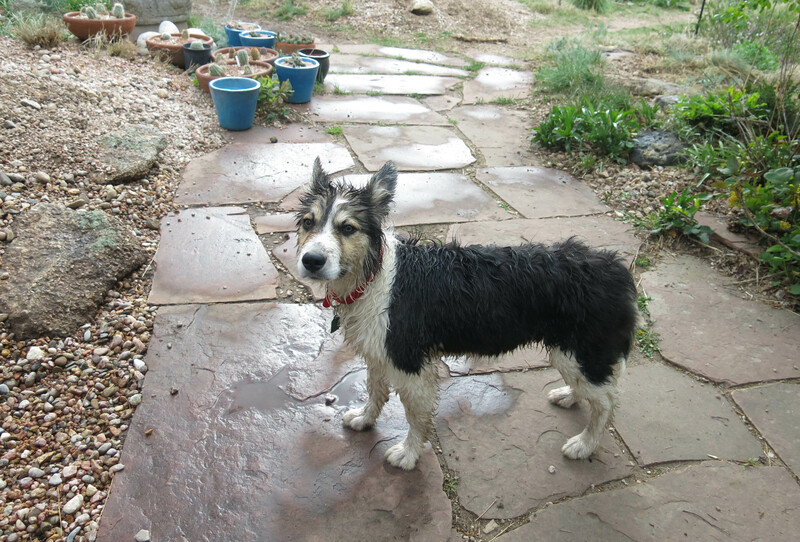 The aforementioned predecessor enjoyed hose herding too, and playing in the sprinkler, as the post called Watering—the Movie attests. Yes, the shampooing is kind of a mania. The stairs got shampooed today. There was a lot of noise, high-pitched screeching and the sound of foam being sprayed. Then the fan drying it all out. It seems endless.